On a broad bay dotted with pretty islands, Fethiye has one of the most beautiful natural harbours on the Turkish Mediterranean coast. It's also within a short drive of two of Turkey's most beautiful beaches, Çal Beach and Ölüdeniz, and the best places to stay in Fethiye offer easy access to both. Considering its natural assets, Fethiye is relatively small - due to its precarious position as far as earthquakes are concerned. But these dramatic, destructive moments in the town's history only make it a fascinating as well as beautiful place to visit. The last big earthquake happened in 1958 levelling the town, apart from the ruins of the ancient city of Telmessos which have survived numerous earthquakes. Hence the neat, low rise buildings are all relatively new. Fethiye is probably the only town in the world where you'll find sarcophagus in the streets that are beautifully lit up at night. These Lycian relics, like the wonderful tombs cut into the cliffs above the town, give Fethiye a totally unique look and feel. Swim, lounge, parasail, paraglide, sea kayak, sail, jet ski - Fethiye is a wonderful place to be out on the water. It is one of the best places in the world to try paragliding, because of the spectacular view of Ölüdeniz's perfect lagoon on descent. This is also a great spot for island hopping and an armada of small vessels leaves port every morning to explore the charming islands dotted around the bay. The Lycian Way extends over 500kms along the coastal area of the ancient land of Lycia, between Fethiye and Antalya, and is recognised as one of the world's best long-distance walks - for more information visit Walkopedia. Spectacular and remote, you pass through beautiful countryside scattered with the reminders of past civilisations. Even if you're not planning to do the whole thing, there are still plenty of small sections you can do around Fethiye. Saklikent Gorge is another great hiking spot close to Fethiye, as is Kayakoy, the ghost village, which is the ruins of a Greek village abandoned in 1923 when Greece and Turkey had mandatory population swaps. Fethiye is a good place to stay if you want to explore some of the great ruins of the Lycian Coast. Fethiye also has plenty of free attractions, such as the great Tuesday farmers' market, an impressive Roman Amphitheatre, a fort, the rock tombs - including the huge Tomb of Amyntas - and a museum housing fascinating items from the tombs and the ruined towns. If you're coming in the busy summer months then be sure to book ahead as the best places to stay in Fethiye get quickly filled up! The cliffside Hotel Unique is a lovely spot, offering boutique rooms - featuring light hues and wooden furnishings - as well an outdoor pool and restaurant. Plus, you're just minutes away from the beach! 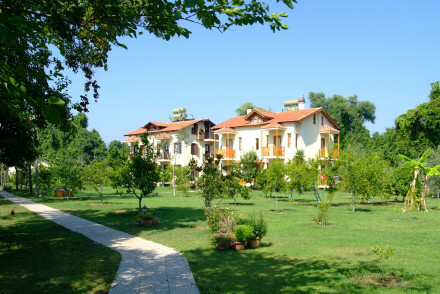 The 14 rooms of the Yonca Lodge are split between four different houses, set amongst beautiful fruit trees and green lawns, in the spectacularly beautiful Gulf of Fethiye. Sun loungers sit waiting for you along the beach, chickens and ducks mess around in the gardens and there's an open-air bar and great restaurant serving local produce. All starting from just €70 per night including breakfast. Boasting an enviable location overlooking the Gulf of Fethiye, Yacht Classic Hotel boasts light and airy contemporary accommodation with suites available. There are plenty of activities to keep the kids entertained, whilst the grown ups can unwind in the extensive spa. If you'd prefer the privacy of a self-catering option then browse through the wide variety available online with our partner Booking.com. For the best weather visit in the summer, with the average daily temperature rising to 28°C in July and August. This however is peak season, so for a quieter and potentially cheaper alternative consider coming in May, September or October. Don't worry, the weather's still lovely enough to spend your days lounging on the beach! International visitors can fly into Dalaman Airport before taking a direct bus service to Fethiye, a journey which takes around an hour. For car hire prices, we recommend you visit our online partner Rentalcars. 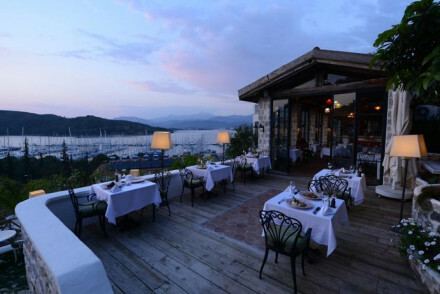 Widen the net to search through our recommendations in Dalaman or Bodrum. Alternatively, feel free to contact one of our friendly gurus for advice. It's all in the location at this small hotel set in stunning gardens with a private beach. Traditionally styled rooms feature open fireplaces and terraces. Mediterranean and Aegean cuisine is served by a stream. An abundance of activities within easy access. Ideal for family holidays. Eco break - Great attention is paid to eco processes and sustainability- all natural building materials and the restaurant is organic. Total relaxation - Unwind in the lovely organic fruit orchards, overlooking the beach with comforting home cooked meals served al fresco. Diving - Head to one of the local dive centres and explore the crystal clear fish filled waters. Fishing - Fishing is available from the hotel, without charge. Try your hand at catching dinner! Built in line with traditional Turkish custom, this boutique hotel exudes local originality. From its Lycian ruins entrance to stone and wood walls, it's a celebration of Fethiye's culture. Explore the stunning coastline or dive into enthralling market streets. Ideal for a taste of Turkish culture. Romantic Break - A deeply romantic resort with elegant suites overlooking the turquoise waters, Turkish hammam and fantastic food. Beach Life - An incredible cliff-side resort carved into a series of terraces leading down to the sparkling Aegean Sea. Local markets - Check out the local market place, within a short walk of the hotel. Sights nearby - The Telmessos Rock Tombs are within a mile of the hotel. 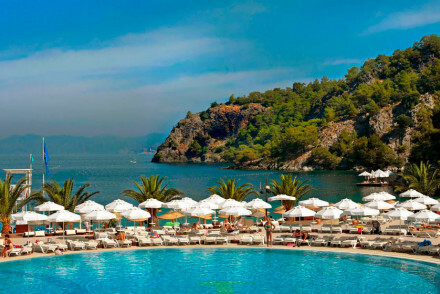 Luxury hotel overlooking the Gulf of Fethiye. Rooms light, spacious and contemporary with elegant furnishings and french doors that open out to private sit-out balconies. 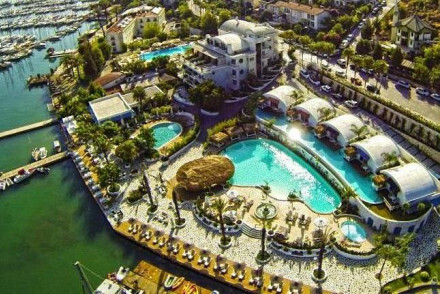 With Turkish baths, glorious outdoor swimming pools, spa, private marina, outdoor restaurant and bar. A place to unwind. Nestled on Fethiye’s Mediterranean coast this resort boats three private beaches (one adults only) no less than five bars, three restaurants and a nightclub. There are kids clubs, arts and crafts, tennis court and many water and outdoor activities. Modern rooms have private balconies views that wow. Diving - There is a diving school on the beach and you can aquire certification should you not already have it. Sailing - The hotel organises day trips to your choice of the surrounding islands.